Many industrial processes require large quantities of liquid air, liquid ammonia, liquid carbondioxide etc. The production of liquids from various gases is therefore an important commercial operation. There are different methods of liquefaction of gases, such as (i) based on the concept of critical temperature followed by the compression (ii) based on Joule-Thomson effect (iii) Adiabatic demagnetisation. In the case of gases like NH3, Cl2, SO2 and CO2 whose Tc values are near and below the ordinary temperatures, they can be liquefied easily by increasing the pressure alone at their respective Tc values. Gases like H2, O2, N2 and He have very low Tc values and hence Joule Thomson effect may be applied to bring in effective cooling. Helium is cooled by Joule-Thomson effect to a lower temperature and further cooling for its liquefaction, is carried out by the method of adiabatic demagnetisation. This method makes use of Joule Thomson effect and is used to liquify air or any other gas. Pure air or any gas is first compressed to about 200 atmospheres and is allowed to enter the innertube of the concentric pipes as shown in Fig.10.8. The valve v of jet J is then opened and the gas is allowed to expand suddenly into the wider chamber C.
The gas gets cooled due to expansion and its pressure is reduced to about 50 atm. The gas is now allowed to pass through the outer tube `O'. At this stage the incoming gas is initially cooled by the outgoing gas. Further cooling of the incoming gas occurs during expansion in the chamber C. The cooled gas is again compressed and is circulated in. By repeating the process of cooling and compression followed by expansion, the gas is liquefied and finally the liquid air drops out from the jet into the bottom of chamber C.
In this method compressed air is allowed to do mechanical work of expansion. This work is done at the expense of the kinetic energy of the gas and hence a fall of temperature is noted. 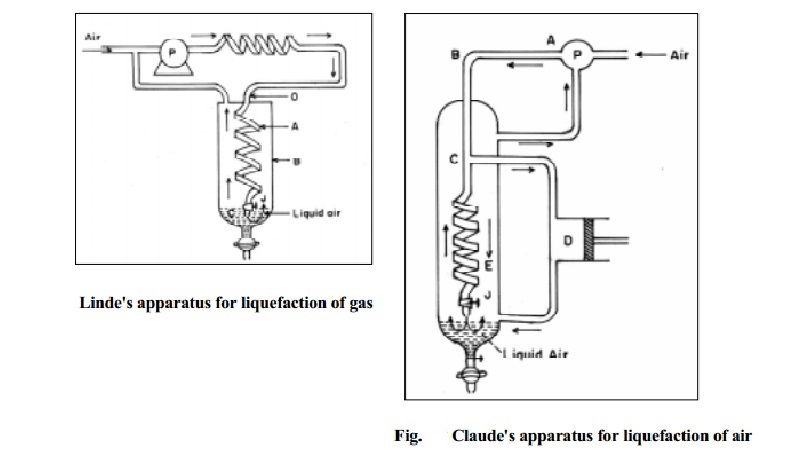 This principle is combined with Joule-Thomson effect and utilised in Claude's process of liquefaction of air. Air is compressed to about 200 atmospheres and is passed through the pipe ABC (Fig.9.9). At C, a part of the air goes down the spiral towards the jet nozzle J and a part of the air is led into the cylinder D provided with an air tight piston. Here the air moves the piston outwards and expands in volume as a result of which considerable cooling is produced. The cooled air passes up the liquefying chamber during which process it cools the portion of the incoming compressed air. The precooled incoming compressed air then experiences Joule-Thomson expansion when passed through Jet nozzle J and gets cooled further. The above process takes place repeatedly till the air is liquefied. Generally, the method used to reach the very low temperature of about 10-4 K is adiabatic demagnetisation. In this method the paramagnetic samples such as Gadolinium sulphate is placed surrounding the gas sample and cooled to about 1K along with the gas in any one of the cooling methods. The paramagnetic sample used in this method is suddenly magnetised by the application of strong magnetic field. This magnetisation (ordering of molecular magnets) occurs while the sample surrounds the cooled gas and has thermal contact with the walls of the container. When the magnetic field is suddenly removed, demagnetisation occurs which brings in a disordered state of the molecular magnets. To reach this state thermal energy is taken away from the cooled air such that its temperature gets further lowered. By this technique, as low as zero kelvin can be reached.